Thermal Cutting Device (TCD) for synthetic fabrics, that works in combination with the embroidery machine, to cut embroidered applique, embroidered patches, labels, perforate fabrics, die cut fabrics, cut and sew applique letters, corporate logos and so on. Ideal for embroidery applique cut, kiss cut, die cut, perforation, reverse applique. It can be installed on any singlehead and multihead embroidery machine, close to the last or first needle. 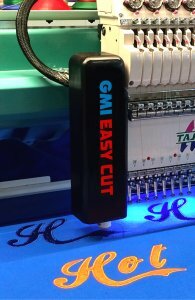 The cut is precise and always in register with the embroidery; the working height of the hot needle tip is controlled by the software developed by GMI and supplied with the thermal cutting device. Few examples of machine embroidery cutwork designs made with GMI Easy Cut device applied on an embroidery machine: kiss cut embroidered appliques, die cut embroidered patches, kiss cut patches, military patches, corporate logos, cut and embroidered letters, reverse appliques, clothes decorations, embroidery applique on baby clothes, etc.